Contractor: O’Hara & Gercke, Inc. 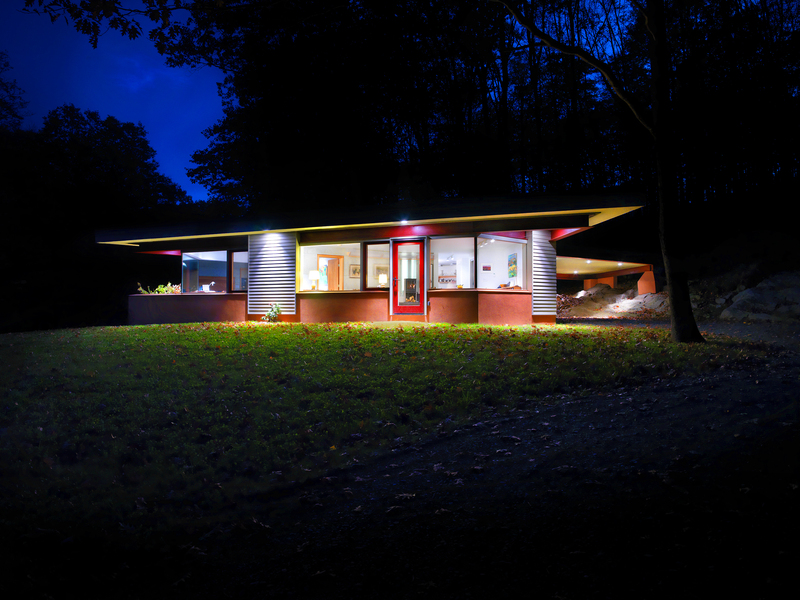 Contemporary Norwich architects have built upon early modernist concepts that emphasized siting, light, openness, and material. Today, new building materials and a more sophisticated understanding of thermal mass mean that it is possible for a house to have large windows and at the same time achieve net zero-energy use. Current ideas about preservation of open space mean that homes continue to connect to the site, but are now situated at the edge. The Jacobson House is integrated with nature through form, materials, and its relationship to the landscape. The siting of the house to the edge of the field intensifies that edge and bridges the forest and the field. Triple-glazed windows and thermal mass in the walls, floors, and partitions create maximum energy efficiency. The house also incorporates local and long-life-cycle materials, low- maintenance materials, and renewable fuel sources, all strategies embraced by today’s architects searching for paths to low environmental impact. Also open by appointment. If you are traveling to visit us, it is recommended you call or email in advance so we may be sure to accommodate you. Subscribe to our mailing list for news and updates about programs and events. Enter your email and click Subscribe.